The founder Yasuchika who established the reputation of "The Tsuchiya in Edo" is from Shonai of Dewa Province (present Akita Prefecuture). He is counted among the "Big Three of Nara". His works are full of poetic sentiment but also steady-going. He was born in 1670 at Tsurugaoka castle town of Dewa Province as a son of Tsuchiya Chuzaemon who belonged to Shonai Domain. 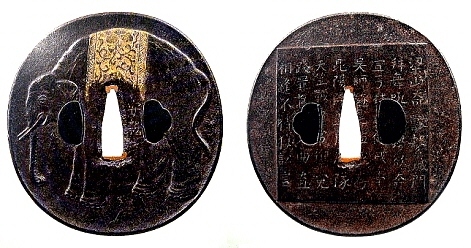 Yasuchika studied metal-carving under Sato Yoshihisa. Later, he abandoned Samurai position and determined to earn his living out of matal-carving. He married with a daughter of his master. At his age of 34, he left his wife and child with his father in law and went to Edo. 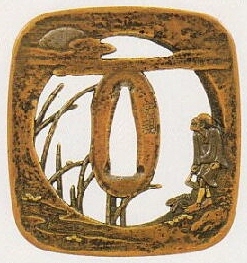 He studied how to make tsuba under Nara Tatsumasa. During the Shotoku era (1711 - 1716), he was invited with a nice fat stipend from the Matsudaira Yorisada daimyo family of Moriyama Domain. Though, he resigned the position and started practice at Kanda of Edo area.